We could not cut this 24 side'Vogel' style ourselves so we sent this rose quartz pure mineral to the diamond dis trict in Antwerp in Belgium to have it 24 side'Vogel' style cut. ROSE Quartz Crystal Cut V OGEL'style' PENDANT. Including Hand Made Silk, Velvet, Faux Fur lined pouch to hold this amazing crystal. This is a very rare natural , untreated and fine crystal for REIKI HEALING. REIKI: The spiritual life force, or vital spiritual energy, said to reside in all living things. Rose quartz mined from the Pitorra Mine, Galileia, Minas Gerais , Brazil. 72.79 mm tall x 2 7.36 mm wide at widest point. Similar to: Marcel Joseph Vogel Cut. This real rose quartz 24 side cut'Vogel' style pendant was taken to and has been blessed and empowered in the DORJE DRAK MONASTERY in TIBET. And at Glastonbury Tor (The ancient Isle of Avalon) (pictures below). The perfect & finest power source to channel the Universal Life Source Energy. This is the most powerful crystal which is a perfect tool for all types of healers. ROSE QUARTZ CRYSTAL IN ROUGH WAS MINED AT PITORRA MINE, GALI LEIA, MINAS GERAIS, BRAZIL. We have had this silk and velvet, faux fur lined pouch made for us to hold this amazing Rose Quartz 24 side cut crystal. REAL ROSE QUARTZ CRYSTAL 24 side cut VOGEL'type' PENDANT. This natural rose quartz crystal 24 side cut'Vogel' style pendant brings knowledge and information concerning healing and spirituality. Both healing and meditation have been enhanced. This rose quartz pendant can induce total centering of the self and can produce a huge spiritual energy which is important for self channeling. This special 24 side cut'Vogel' style pendant contains a very special "OM" vibration which your body can attune to with the special resonance and you will be able to radiate special high power energy and be more in tune with your higher self. This is a pure real rose quartz crystal which was mined from the Pitorra Mine, Galileia, Minas Gerias in Brazil. With this rose quartz 24 side'Vogel' cut pendant you will be able to amplify both your body energy and your thoughts. This real rose quartz crystal pendant when held will help you in the creation of inner body power and will bring the energy of the stars into your soul. 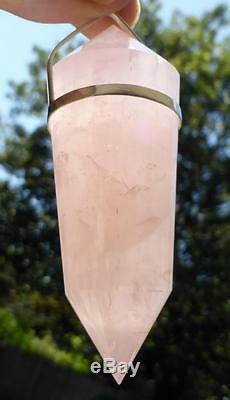 This is a true real natural rose quartz crystal pendant and is a STONE OF POWER and HEALING. When you hold and wear this sacred ble ssed rose quartz 24 side cut crystal'Vogel' style pendant and meditate with it you will be in tune with yourself and be able to speak with and communicate with spiritual and other worldly masters, teachers and healers. A natural rose quartz pendant such as this can be used to clear and to activate your energy centers, it provides for purification of the physical, mental and your spiritual mind. It will help you in healing any negativity that is in you. This pure, real, untreated rose quartz crystal pendant will help direct your "body energy" and will help to banish all inner negativity and will stimulate your positive energy with special thoughts and feelings. This sacred rose quartz crystal pendant when held and cherished will direct your energy into the higher spiritual realm. THIS REAL NATURA L ROSE QUARTZ CRYSTAL 24 SIDE CUT VOGEL'style' PENDANT IS A TOOL AS WELL AS A MAGNIFICENT PIECE OF JEWELLERY. IT IS NOT THE CRYSTAL WHICH WILL DO THE WORK BUT IT IS YOU WHO WILL HOLD IT AND IT IS YOU WHO WILL CHANNEL YOUR WILL TO HEAL AND TO HOLD THE EXTRA POWER. You can meditate with this pendant. You can hold it and you will be in tune and at one with this special power crystal. To heal someone, you must first know why people suffer. If, through healing them, you can show them how to stop suffering, you have fulfilled your role as a physician. At the heart of all suffering there is a spiritual remedy that comes about from knowing the relationships between karma and suffering. Karma comes from the chaos that exists within all living creatures. All aspects of this world and the universe at large. Some chaos is good, some indifferent, some bad. But it is the stuff from which happiness and then enlightenment can be made. This is a sacred blessed real rose quartz crystal that has been sourced by Lama Thubten Dagom Rinpoche from Brazil. T his pure, natural rose quartz crystal has been 24 side'Vogel' style cut into a wearable pendant. Lama Thubten has asked me to release it to the world. This rose quartz crystal pendant is full of great spiritual power. The reason for the release of this sacred blessed crystal pendant is that the world is now a dark and dangerous place and Lama Thubten would like spiritual and sacred people to be part of the new awakening. This rare Tibetan high altitude crystal pendant has a HUGE amount of power inside and when you hold it you will see and feel a sacred power like you have never felt in your life. There are very few people in the world who can feel and sense and need this sacred and special power. If you are not one of them then this is not for you. This rose quartz crystal 24 side'Vogel' style pendant is a sacred and blessed spiritual item and is not just a normal rose quartz crystal pendant. It must be treated with respect and care and with the correct use the power will just grow and grow. You can touch someone with this rose quartz crystal pendant as a blessing or a healing practice. The deepest power of this rose quartz crystal pendant is in you, this rare rose quartz crystal which has been mined in Brazil is very rare and special and the spiritual power is inside the sacred crystal. When you receive this sacred rose quartz 24 side cut crystal pendant you must pray for the welfare, happiness, health and wealth of all beings. In praying like this you are also praying for yourself. You must form a strong bond yourself with this sacred rose quartz crystal pendant. The main power and secrets of this crystal pendant will be inside you, and it depends upon your relationship with this sacred and blessed item. You must cultivate your relationship through your own mind during prayer, meditation and while reciting mantras. You will create more power every time you use and wear this rare spiritual rose quartz crystal pendant. When you wear and use a sacred item such as this the spiritual power will get stronger and stronger and the sacred crystal pendant is activated. This sacred rose quartz crystal pendant is already highly charged by prayers and blessings. Every time you wear and use your spiritual pendant remind yourself of the importance of keeping a positive state of mind, wish good to others and open yourself up to a spiritual and sacred higher force. You must use this sacred item with the intention to bring happiness, joy, loving-kindness and peace into the world, the more that you wear and use it the greater the power. Many or us are trying to find peace a small place where we can enjoy our lives. We look around and watch the world go by. All we wish to do is to find a small amount of peace and tranquility in the world today. There are huge amounts of negative and bad energy flowing. Many dark energies are around and trying to posess us. They try to find a host, when we are at a low point in our lives, when we are weak and vunerable. Our Sacred Blessed and Empowered items have PURE POSITIVE SACRED POWER and they can and will be attuned to you. Do you remember long ago that you had the ability of second sight, and other special abilities. You might never have revealed this to anyone as you felt slightly afraid and were not sure in yourself. Years later life takes its toll and you now think that these special abilities that you had years ago are now gone. These abilities NEVER GO, you still have the same abilities but you now have to clear a path to open your mind and be able to go back to your childhood and let your mind open up. When you work with Lama Thubten's Sacred Blessed items you will soon realise that these are SACRED SPECIAL TOOLS and will work for you in many different ways. They will open up a PURE POWER FLOW FOR YOU, and enable PURE POSITIVE ENERGY to enter your divine spirit. The Dorje Drak "Varja Rock" Monastery in Tibet. The Dorje Drak which means Varja or indestructible rock monastery is one of the six great seats or mother monasteries of the Nyingma lineage. This monastery was better known as the seat of the Northern Treasure (jang-Ter) tradition. This monastery was completely destroyed in the Chinese invasion and has been restored. There are now about 100 monks performing studies and retreat at the monastery. Inside the Dorje Drak Monastery. Glastonbury Tor (The ancient Isle of Avalon). Our sacred, rare, empowered and blessed items are being made available for the benefit of practitioners, like you, who would like to have holy objects as devotional support to your practice. Rather, we are making them available with the express wish to benefit others. All funds in excess of our costs help us to continue our activities. Sellers: Get your own map of past buyers. The item "ROSE QUARTZ SPIRITUAL VOGEL PENDANT 24 side cut. REIKI SPIRITUAL HEALING" is in sale since Monday, May 26, 2014. This item is in the category "Collectables\Rocks, Fossils & Minerals\Crystals". The seller is "spiritual-sky" and is located in Bournemouth. This item can be shipped worldwide.